Growth… possibly the most powerful word on Wall Street. Make no mistake about it, when it comes to the stock market, growth is EVERYTHING. Traders and analysts are constantly looking for growth. The reason is simple, in order for a company, through its underlying stock to appreciate in value, a company has to continue to grow its profits. To understand why growth is so important you have to understand how the market prices stocks. Stocks are priced based on not only their past earnings, but also their future expected growth rates. You have to always assume that all available information is already priced into stocks, so stocks should (but are not always) priced reasonably compared to their current and past earnings. This produces a stock’s valuation. A stock’s value is determined by the current price/earnings, or the P/E ratio. If the market believes a stock is fairly priced with a P/E of 18, then the only way the stocks price can rise is if the earnings rise which will allow for share price to move higher and maintain the same overall valuation. Stocks with high forecast growth rates tend to trade at higher multiples for that very reason. Even companies that dominate their sectors and have enjoyed big growth in recent years will run out of steam if the market does not believe the company can continue to show strong growth moving forward. Growth is the key, and here are five stocks that have forecast earnings growth off the charts. 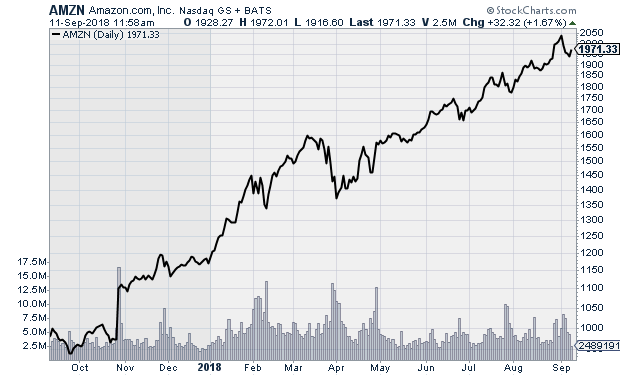 Tech giant Amazon.com (AMZN) has always traded at high multiples, simply because Wall Street believes so strongly in the company’s future growth. AMZN shares currently have a trailing P/E of 153, which is incredibly high, but its future P/E is lower (but still high) at 76. Why would anyone buy a stock with such a high multiple? Simple… analysts forecast that the company is going to enjoy average annual earnings growth of 46% over the next five years. This follows on the last five years where earnings rose by 66% per annum. Growth is slowing, but any company would love to be looking at potential 46% growth a year for the next five years. 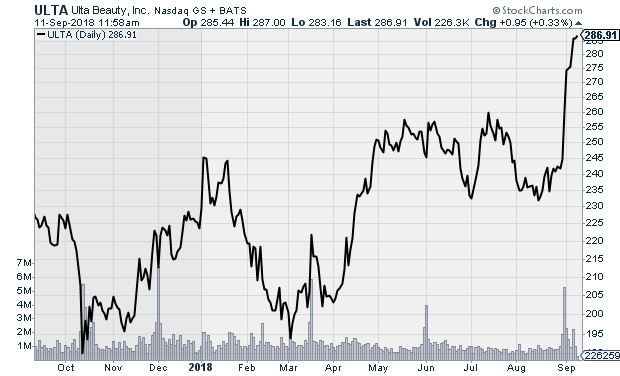 Amazon has a lot of things going for it, and if it is able to grow at the rate analysts expect, the stock should continue to be a strong outperformer. AMZN trades at $1,960.25 with an average price target of $2,108.06. Netflix (NFLX) has been enjoying strong international growth, and thanks to a powerful lineup of original content the video streaming leader is also enjoying good domestic growth in the U.S. The company has invested heavily in original programming to attract and retain customers, and the investments have been paying off in a big way. Netflix has enjoyed strong earnings growth of 42.3% per annum over the last five years, and analysts expect even stronger growth moving forward with a forecast average annual earnings growth rate of 62.3% for the next five years. With such strong growth, and the company’s success at growing subscribers both domestically and internationally NFLX looks like a great stock to buy and hold for the long-term. 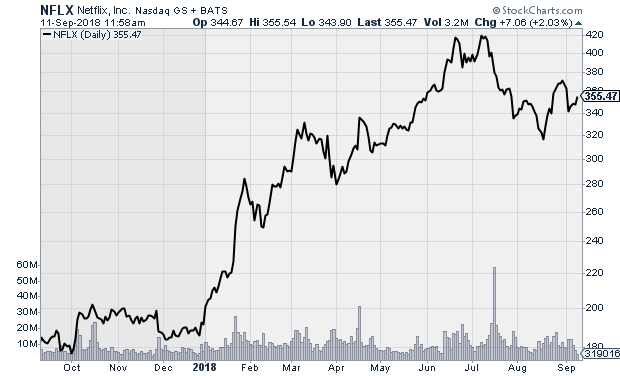 NFLX currently trades at $352.60 with an average price target of $375.83. Software maker Adobe Systems (ADBE) has been enjoyed incredibly strong earnings growth over the last five years, and even though earnings growth is slowing versus the strong comparables, analysts see ongoing growth, and forecast earnings will continue to rise by 24% per annum over the next five years. The company has enjoyed strong growth in its Creative Cloud and Document Cloud businesses, which should continue moving forward. ADBE stock has enjoyed steady gains over the last five years, and if the company is able to keep pace with its future estimates there is plenty of upside left in the stock. The company has a forward P/E of 34, which is a little high, but reasonable considering how successful the company has managed to grow, and how strongly it is expected to continue to do so. 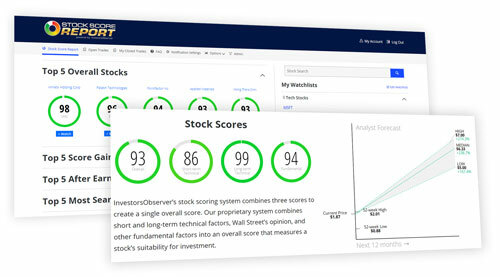 ADBE trades at $266.48 with an average price target of $265.11, but if the company is able to post solid fiscal Q3 results on September 13 you can expect analysts to lift their targets to allow shares to build on their recent gains. 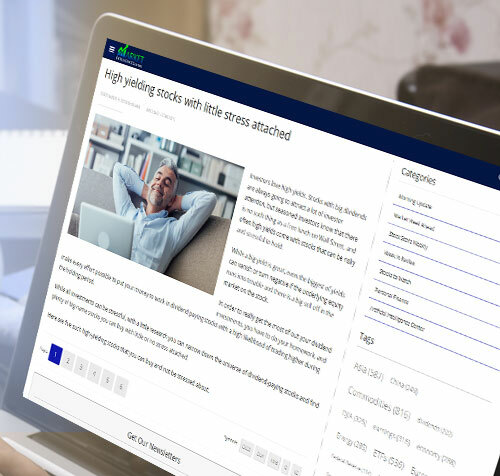 Online broker E*Trade (ETFC) has benefited from rising interest rates, and with the Federal Reserve widely expected to continue lifting rates the company should enjoy strong earnings growth moving forward. E*Trade earns around 75% of its overall earnings from interest income, far more than it generates from trading commissions and fees. The reason being that it is able to invest its client’s deposits in fixed-income short-term investments prior to needing to use the cash for new trades. With such a heavy exposure to interest rates, it comes as no surprise that earnings are expected to rise as rates increase. Looking ahead, analysts forecast E*Trade will grow profits by 22.5% per annum over the next five years. 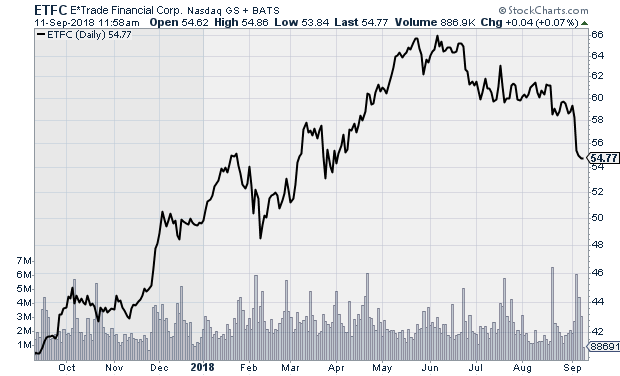 The stock currently trades at $54.57 with an average price target of $68.30. Ulta Beauty (ULTA) is a U.S. beauty retailer that sells products such as cosmetics, perfumes, and hair and skin products. 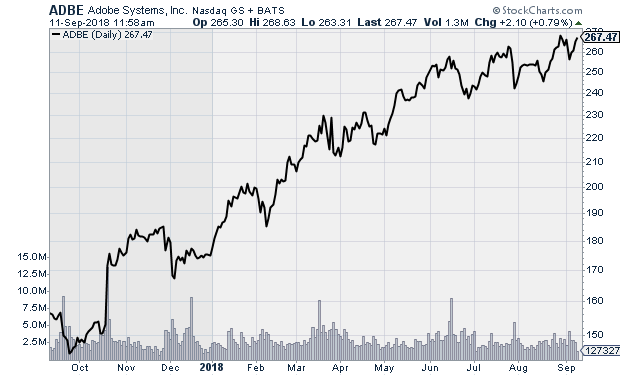 The stock has risen sharply over the last year and is currently trading just pennies below its 52-week high. Earnings over the last five years have been impressive at an average annual rate of 30% and looking ahead analysts believe the company will continue to put up strong numbers. Estimates call for future annual earnings growth of 22% for the next five years. The company has a strong track record of posting better than expected quarterly profits, and if that trend continues its future growth will be even stronger than expected. ULTA trades at $286.59 with an average price target of $276.